Find freedom climbing walls of rock and get acquainted with wild mountaineering at Krasnoyarsk’s most impressive natural sight, the Stolby Natural Reserve. 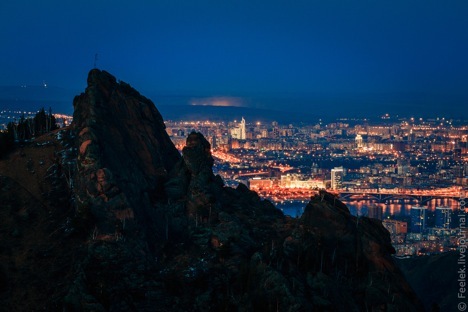 Krasnoyarsk (3,354 kilometres from Moscow), located on the Yenisei River, is a lucky town. The ‘Stolby’ (pillars) Natural Reserve is right next door; a huge taiga region which conceals gigantic pink and grey cliffs and is the ultimate paradise for rock climbers and mountaineers. What makes this place so special and why should you join these fearless rock climbers? The Stolby Reserve is divided into several areas. Central Stolby, the main cliff area, is 5 kilometres wide and 10 kilometres long and is open to all, but the Wild Stolby region is restricted and not recommended for ordinary tourists. Among the Reserve’s stunning sights are the cliffs called ‘Feathers’, ‘Lion’s Gate’, ‘Grandpa’, ‘Grandma’, ‘First Pillar’ and ‘Second Pillar’. These massive rocks got their names from their unusual shapes. ‘Stolbizm,’ unlike ordinary rock climbing, is not a kind of sport. It is a form of amateur free climbing. Authentic “stolbists” can climb a rock or its vertical face without the help of ropes, hooks or any other type of mountaineering equipment. A skilled ‘stolbist’ can come down one of the most dangerous cliffs, ‘Feathers’, using the “shkurodyor” technique; which means, going down along vertical splits in the rock face by wedging themselves with their shoulders between the rock’s faces. The editorial staff at RIR does not recommend practicing rock-climbing without protection ropes. ‘Stolbizm’ is also a philosophy, comprising friendship, mutual assistance and active socializing. ‘Stolbists’ have their own circles, real clans with names such as “Griffins” or “Abreks,” taken from the names of 19th-century guerrillas in the Caucasus. Each group has its own “izba” (hut) in the reserve. It’s not easy for strangers to get into one: not only do you need a key, but you also need to know how to climb a cliff. The Griffins’ small wooden house, for example, is located at the top of a 50 metre-high cliff, one of the faces of which is vertical. ‘Stolbist’ Roza Petrova shared her experience: "It's so great to be here any time of the year, especially in the fall. Going the familiar way to the hut makes me feel so peaceful and happy. Friends are already waiting for me at the hut and have put the kettle on. We get together, talk, laugh, sing to the guitar and go to the rocks where we climb. Surrounded by taiga forests, the view of Stolby is so inspiring that it feels like my soul flies." At the end of the 19th century politically active youth used to come to the Stolby. In 1899, as a form of protest against the mistreatment of stolbists by the police, several revolutionaries climbed the Second Pillar cliff and wrote the word “freedom” on it. The writing has been being carefully inscribed for over a century now and is considered the symbol of stolbizm. Until the 1990s there wasn’t footwear good enough for rock climbing anywhere in the Soviet Union, therefore stolbists used to climb the cliffs in galoshes. Quality rubber could keep a person on the rock even after rain and in cool weather. Today stolbists wear modern rock-climbing footwear. The Central Stolby area for tourists is quite big, so you’ll need a whole day for a visit and should wear sneakers and sportswear. It’s difficult to get lost in the reserve, as there are signs everywhere. All the same, it’s advisable not to go off the beaten path, for you are surrounded by wild taiga. Climbing the pillars on your own is not recommended, as parts of it can be quite dangerous. In the Central Stolby area there are toilets and kiosks selling food and drinks. Still it’s better to bring some extra sandwiches and water with you. The Stolby Reserve is open all year round.